The person who died: why didn’t they take better care of themselves? Why did they take such a stupid chance? What were they thinking? The medical community: why didn’t the doctor force them to take better care of their health? Why didn’t the paramedics get there sooner? Why hasn’t someone discovered a cure for cancer, etc.? God: why did you make a good person suffer? Why did you leave those children without a parent? Why them? Why now? Why not someone else? Why not me? The family: why didn’t they make him go to the doctor? Why did they let her live alone? Death is, after all, the great unknown. Despite stories of white lights and visions of deceased relatives, no one’s come back from any extended time in the afterlife. We don’t know what awaits us. And we REALLY don’t know why people die when they do. We say “it was just their time,” and obviously, it was. As a friend, that sense of helplessness can create even deeper anger. Many times when I’ve grieved I’ve been angry, although I rarely shared those feelings. 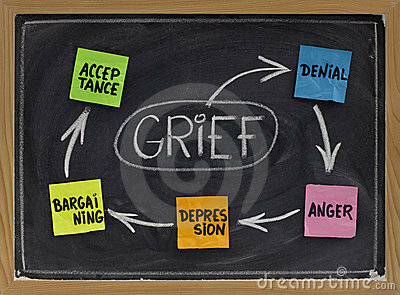 Despite being one of Elisabeth Kubler-Ross’ famous stages of grief, it’s probably the least acknowledged. Anger can be useful, but when turned inward, is more likely referred to as depression. That’s not what I’m talking about here. I’m talking about white-hot, body-shaking, screaming-at-the-top-of-your-lungs anger. You’ve already realized that the grief you feel for your friend is being devalued because you’re not family. And that can add to the anger you already feel. Even those who are also grieving are unlikely to accept your anger. Think of Sally Field melting down in the cemetery in Steel Magnolias, and the shock on her friends’ faces. The minister in The Big Chill - “I’m angry, and I don’t know what to do with my anger” - is much calmer about it, but the look in his eyes is anything but. The problem with suppressing the absolutely justified anger we feel when a friend dies is that it will bubble up eventually. It will present itself suddenly and loudly and often in a completely unrelated situation. And that presents its own complications. Screaming at a barista who doesn’t know you won’t bring back your friend. Embrace that anger: accept it and embrace it. You’re angry because of the pain that your friend’s death has caused. That’s, dare I say it, normal. Frankly, it would be strange if you weren’t angry. You’re angry because you loved them and wanted them to stay close to you always. Selfish maybe, but normal and human. So, as long as you don’t hurt yourself or anyone else, you have my permission to be angry. Then you can work on channeling your anger into positive action, to keep your friend’s memory alive every day of your life. Viki, You've captured the sources of anger, and you're right - it's raw and real. It's reassuring to hear that it's normal, because we spend so much time internalizing it, and letting it fester. Channeling the anger into something positive is tough, but the right approach. You have an honest, understanding style, with a delicate touch - like nudging us with kid gloves. Well done. I re-posted this, partly because of the memorial service I went to this week. But it's a topic that has really resonated with people. Tears are much easier to deal with than anger, but both are valid. Glad you liked it!